Grigory Maximenko was born in Leningrad in 1988 and began his studies at the Rimsky-Korsakov St. Petersburg State Conservatory. He then moved on to the University of the Arts in Bern (Master of Performance and Specialized Master of Performance). He also receives a scholarship from the International Academy of Music in Liechtenstein, and participates in the intensive music weeks there. The young viola player has also expanded his musical horizons by attending masterclasses held by Yuri Bashmet, Jerzy Kosmala, Nobuko Imai, Jean Sulem, Veronika Hagen, Kim Kashkashian, Hatto Beyerle, Jürgen Kussmaul, Antonello Farulli, Huus Jugendkrup and Sandro Repetto. Grigory Maximenko has been awarded prizes at numerous international competitions, for example 3rd prize at the “International Competition for Young Musicians” in Moscow (2006), 3rd prize at the “International Competition for Young Musicians” in Toljatti (2007), 3rd prize at the “International Youth Competition in Memory of E. A. Mravinsky” in St. Petersburg (2008), 3rd prize at the “Rahn Musikpreis” competition in Zürich (2014) and 1st prize at the “International Music Competition and Festival for Soloists and Chamber Groups Svirél” in Slovenia (2014). The young musician has already gained considerable professional experience playing in various orchestras including the Liechtenstein Symphony Orchestra, the Basel Symphony Orchestra, the St. Petersburg State Symphony Orchestra and the Gustav Mahler Youth Orchestra among other. He also worked as an assistant to the viola class at Bern University of the Arts in 2015. 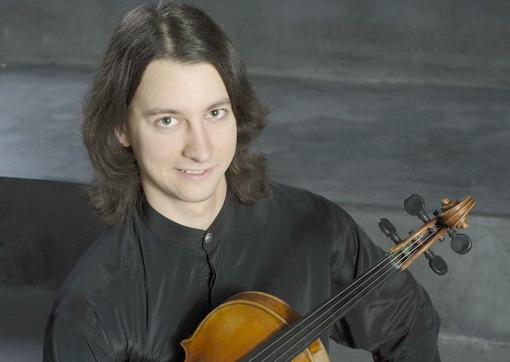 Since 2014, the violist has been principal of the Liechtenstein Symphony Orchestra.